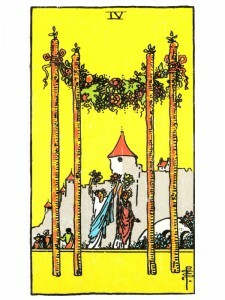 Four of Wands – Completion, a new beginning. You have done well, perfected your work and you will know harmony, satisfaction and peace. Make plans to enjoy the results of your hard work. If you have been enjoying romance – you could be laying the foundations for marriage – it will be a satisfying union. Your mind is active, creative and superior now – past activities will begin to peak, rewards will be received for your past efforts and prosperity will reign. Rise above your present situation and you will feel a sense of completion, the welcomed renewal that comes when opposing energies finally harmonize. Treat these moments as a cleansing time – celebrate and generously share the fruits of your labor – show appreciation to those who supported you. Free yourself from whatever it is that is keeping you from being all that you can be. Allow your higher spirit to help you as you aspire to help others. Celebrate life at every turn – allow yourself to enjoy the rewards you receive as you move through each developmental stage of your life and accept the responsibility of the new levels. You will now experience a domestic environment filled with Spirit, optimism, eagerness and celebration as you are swept along by joy – moving from a defensive situation to one that is open and honest. Your optimism and love of freedom carry you now – together with others – out of your walled city and into the light. You are an initiate enjoying the comfort of being spiritually centered on your path, secure in the knowledge of accomplishments satisfying the Karmic Contract. Spiritual foundation for future work in this incarnation. Your course has been established and proven -feedback is excellent. Your position feels strong and correct. Strong value system in place. There is justifiable celebration. Here are religious and spiritual holidays, fellowship – thanksgiving for what you have received and will receive. Practicing your faith. Utilizing, integrating ritual into daily life. The time for counting your blessings. Profound honesty in all relationships. The balance and harmony indicated, suggests that the lower levels – Mental, Emotional and Physical are balanced as well. Spiritual self-confidence, dedication, order, control, discipline, confirmation – a theology. What are you bringing to completion? What role is “ritual” or ceremony playing in your life? What have you integrated into your life? What Rite of Passage are you experiencing and how are you celebrating it? Next to Hermit: You are creative when alone and have the ability of great self-expression. Next to Magician: Exciting goals, ideas and original projects are developing. Next to World: Possible involvement in large scale operation – powerful vibrations. In the first position: Your life is to be a celebration, an observation of perennial wisdom. There is a lightness to you even at your most serious moments of which there are many. For you are a most serious person, tenaciously efficient, yet so obviously effective to everyone’s benefit as to draw no criticism. Quite the contrary, you are sought out for that quality and for your natural ability to teach by example. In the second position: Within your spiritual home, there lies your main asset and your base of operations. Whether you need extra muscle or money, you know you can count on the material resources that come with your spiritual path. In the third position: The spiritual home you have been preparing is ready. This is a foundation you can rely on for the rest of your life. It represents a body of lessons opening a major gate on your path. The garden in which you now stand will grow and prosper forever, for it is an outer courtyard to the garden of Eden. Celebration is in the air. In the fourth position: Your passion is for faith itself. The excitement of interacting with the rituals and observations energizes you. And yet, it is the underlying security and stability of the state of believing that means the most. In the fifth position: You know that you are well positioned and confident now that everything seems to add up. Everything seems right. A celebration of special ceremony is being considered. In the sixth position: You will be integrating more and more your Spiritual and Emotional Planes as you try to include others into the joy of what you have discovered. You will be creative in how you express, how you witness your faith, initiating new practices while honoring old. In the seventh position: Armed with our spiritual diploma and backed by the foundation of our fellowship, we can be dangerous to ourselves and our brethren. Enjoy your moment of exhilaration at what you know you have achieved but also know that the path is much longer. In the eighth position: You are doing the right work/activities in your Physical/material Plane. It’s quite possible that this work and activity is taking on more and more of an overt spiritual nature. A ceremony or its equivalent occupies the stage now or in the near future. There is hard evidence, a witnessing of the progress that has been made on the path. These are timely observations of the cycles of life. Thanksgiving and/or invocation are in progress. In the ninth position: Relationships and creative projects are in fundamental agreement and in support of your spiritual path. This is a time of great joy as your heart celebrates your coming of spiritual age. In formal religions this is the age of confirmation, usually coinciding with the onset of puberty, the coming alive of your sexuality. Here is celebration of your coming alive spiritually. In the tenth position: Confirmation awaits you, within this next year. There will be many signs to inform and assure you as the myriad pieces you have assembled fall into place. Once imprinted with this picture, your spiritual foundation is secure. From here on life will be both easier and more difficult. Easier, because you will be with understanding and learn your lessons at the higher levels where there is little or no pain and negativity. More difficult, because you will be a brighter light drawing more responsibility since you are equipped to handle it. Could it signify physical death and release from Earth?